So, guess what came in the mail today? Can you hear me squeeing from here? (Open the window. I’ll bet you can.) Yep, that’s right — a single copy of my finished book. With an acknowledgement page. And a photo. Even a price! After all this time, it just doesn’t seem possible that it will officially be out in the world in just 25 days. I’m a little scared to let go of its hand and turn it loose — it’s a big place out there. What if it gets lost? 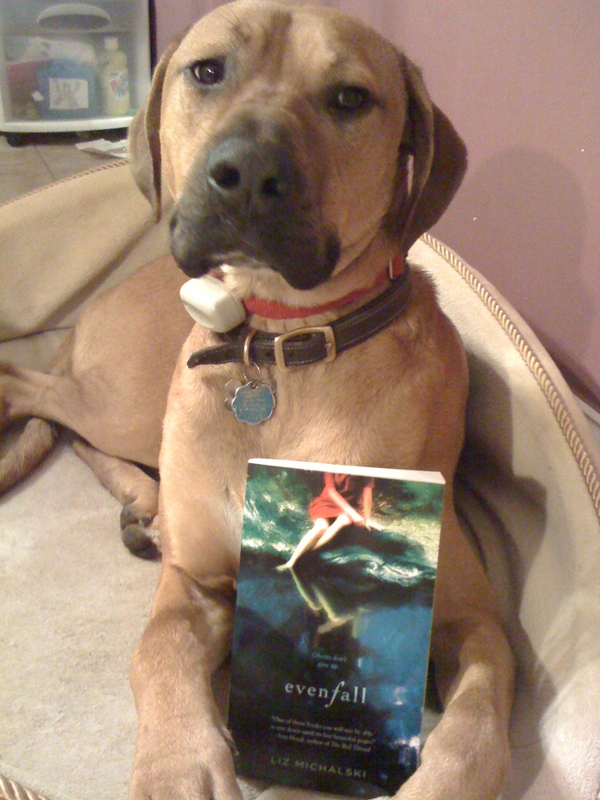 Luckily, Evenfall will be in good company. I’ve been very fortunate to stumble across several writing communities, and friends from these groups also have books coming out in February. Some are debut authors like me, some have books coming out in new formats, and a few are old hands at this publishing thing. Over the next three weeks, I’d like to introduce you to them. They’re good people and good books, all. And to help make the introductions, I’ll be giving away some of those books as well. I hope you’ll come by to meet them. Now, pardon me. I must return to my squeeing. Beautiful! Very happy for you — it’s happening so soon! Yippee!! I hear you sista!! Loud and clear! Can you hear me shouting -b/c in a mere 25 days I will hopefully have my preordered copy in my hands!! So, so proud and happy, buddy. Enjoy this time! Niiiice! And your baby looks so proud of you, too. Congrats, Liz. That’s one beautiful cover to match the beautiful book. Congratulations, Liz!!! It looks beautiful!! I’m looking forward to reading it! Yipppeeeeee! I am squeeing for you too! Enjoy! You deserve it after so much hard work. Thanks so much, everyone. Your support means a lot!! !